This award is given to an employee that performs excellently in all or most of our values and outshines other individual nominees’ total performances. The BOG person of the month is a Go-to- person (ie. resourceful person relied upon by majority for guidance, solutions or assistance on areas not even within his / her field). A solution provider. The BOG person of the month has shown dedication to duty. John Ewa (A Project Analyst in the Project Management Office) receiving his award as the BOG Person of March 2019 from a representative of management – Ayobami Oloyede, Assistant Manager – Admin , Port Harcourt. Ganiyu Akinduro (A Senior Field Service Engineer – Rotating Equipment) receiving his award as the BOG Person of February 2019 from a representative of management – Pastor. Yinka Adetuberu, Senior Rotating Equipment Manager, Port Harcourt. 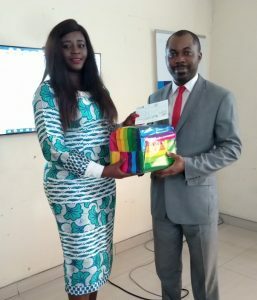 Kareem Atuluku (A driver in the Lagos Office) (second left) receiving his award as the BOG Person of January 2019 from Jessy Eni – Senior Human Resources Manager, supported by Yemi Gbeja – Senior Business Manager and Ifeoma Taylor- Financial Controller. This award is given to an employee who contributed significantly towards improving operational effectiveness in their Unit and BOG as a whole. The most innovative BOG person of the quarter; chosen at the end of every third month, is anyone who has demonstrated outstanding innovation, creativity and agility during the period under review. A go-to-person and outshines other individual nominees’ total performances. 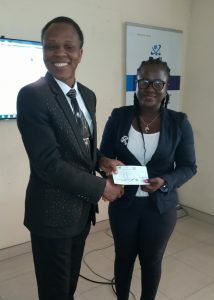 Gift Ayoade (A Senior Finance Officer) receiving her award as the Most Innovative BOG Person of Q1 2019 from a representative of management – Pastor Yinka Adetuberu, Senior Rotating Equipment Manager , Port Harcourt.